Evrostina, also called Zacholi, is12 kms due south of Derveni which is on the old Corinth-Patras national road. Father Menzelides (τελ 27430 32430) from nearby Rozena is in charge and seems willing to make a special trip to the church, if asked. 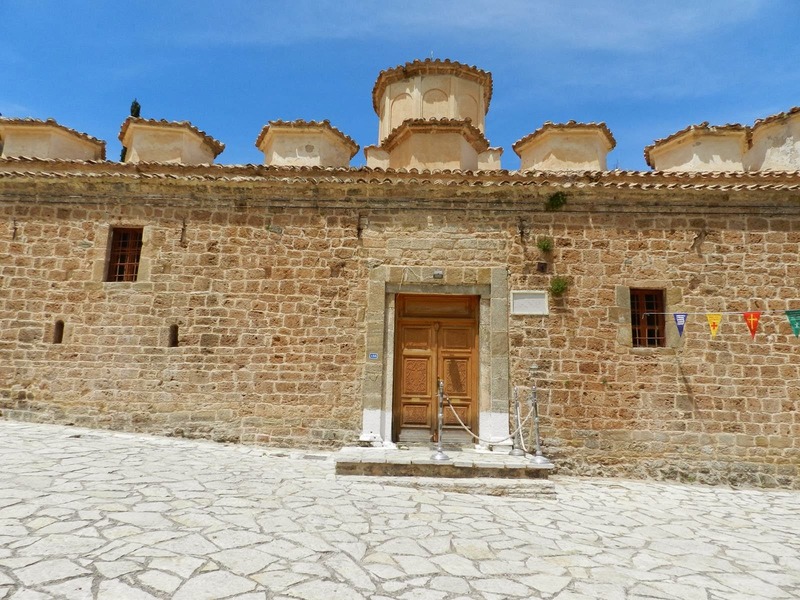 Ag Georgios can be approached either by car or by a daunting staircase in the center of the village. It is always open on Sundays from May21 to Oct 8th and on summer feast days. In the nineteenth century, Evrostina was well watered and prosperous. There was a mill, and enough land around to sustain the 6,000 or so agriculturalists and pastoralists who made up its population. It was just far enough inland from the coast to make policing it an intermittent task on the part of the Ottoman authorities in Corinth. During Ottoman rule, the building of churches was strictly controlled. There were exceptions, but in the Peloponnese these were rare. In order to prevent the building of large churches where congregations might gather en masse and plot sedition, any permission to build came with the caveat that if the roof was not on after forty days, the building would be torn down. This did not suit the villagers who were a stubborn lot, so they devised a cunning plan. Permission was acquired for June, the month with the longest daylight hours, and local sandstone bricks were brought hand over hand, from the nearby quarry. As they were laid, any fool could see that the dimensions (98 feet by 50) were far too big for forty days to suffice. Of course, the church had to be dismantled but that was the plan. Each sandstone block was marked to show its position and then hidden in the village houses. In 1811, a second permission was granted. There are so many stories attached to this church. If some of them have become a bit embellished with the telling, it has only made for better listening. 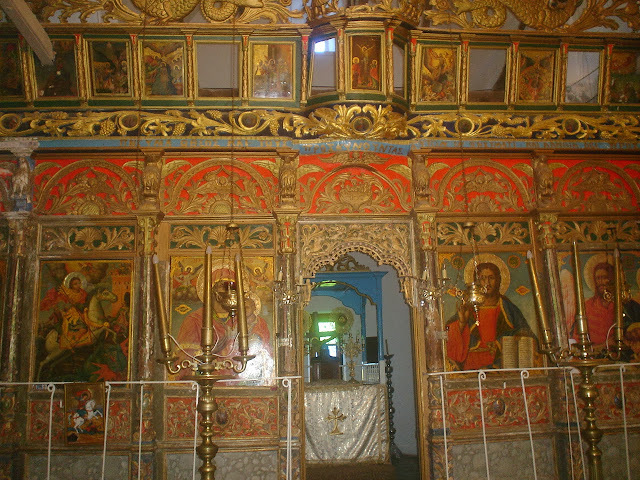 My favourite is the one about the large elaborate wooden iconostasis. Given the plainness of the rest of the interior, its richness and vibrant colours come as a real surprise. Good sized portrait sized icons are placed amid elaborate wood carving and kandylia hang from the beaks of majestic eagles ranged all along the top. It dates from 1823 and is elaborately carved wood with plaster decorations added. A very popular style in the 1900s, this one is especially elegant and, in detail, more reminiscent of Mani churches of the period than of the North Peloponnese. The icons were painted by local brothers and have an interesting trompe l'oeil effect that was very popular all over Europe in that era. Stand on the right side of the church and all of the large icons not only look at you but their bodies appear to turn towards you; stand on the right and the same thing occurs! Try it yourself. 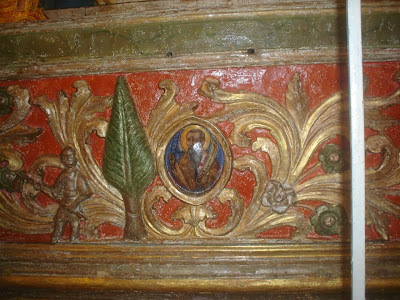 This small carving under an icon one shows the famous tree with the axe-wielder on the left. The gilt dragons along the top of the iconostasis are especially apt given that the Church is primarily dedicated to Saint George the dragon slayer, but they would have been correct simply as symbols of paganism defeated and subservient to the cross and all those New Testament eagles! Behind this impressive iconostsis you would expect to find the altar in the center, the Prothesis to the left and the Diaconion to the right. You would be correct, - sort of. I happened to be there one day when Father Menzelides was receiving visitors after the liturgy. 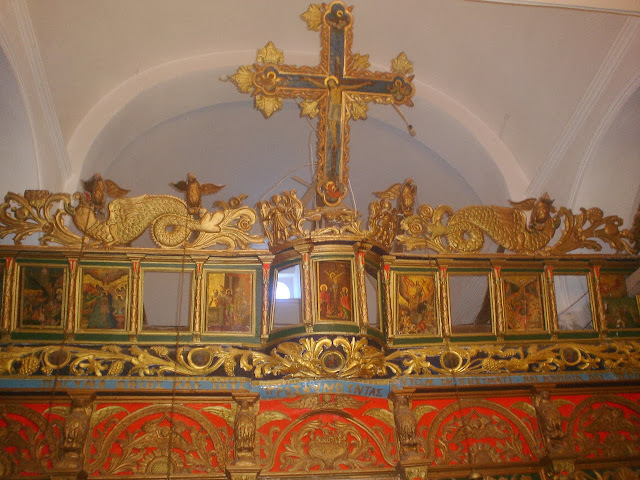 I took a peek behind the iconostasis and was amazed to find that both the Prosthesis and the Diaconion had altars complete with bible and altar cloths just like the central one. That the church is dedicated to three saints: Agioi Constantinos and Eleni (always a pair) , Ag Demetrios, and Ag Georgios does not quite explain it. What does, is the rule that only one liturgy can be performed per day on any one altar and each priest is also confined to one liturgy a day (2). This was partly to maintain the congregational aspect of worship and maybe to make sure the priest remained sober because he is obliged to drink any left-over wine from the chalice if the congregation are few and there is consecrated bread and wine left over. By having three altars and three priests in attendance, this church can have three services, a real advantage on a feast day with a huge attendance. 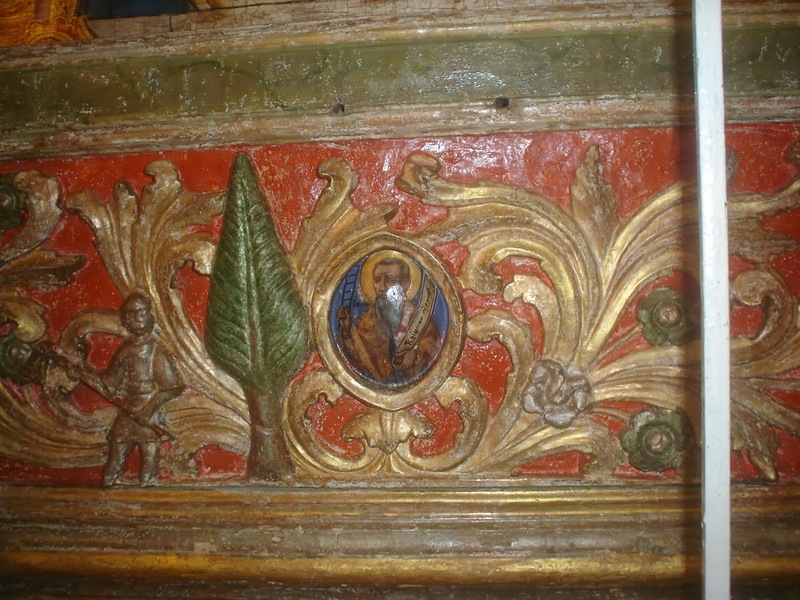 The altar in the prosthesis is dedicated to Constantine and Eleni, the one in the diaconion to Ag Demetrios, and the central one to Ag Georgios! This church has almost too many unusual features, not the least being Father Menzelidis himself. He became a priest at the age of 53, fulfilling a life-long ambition or, as he puts it, fulfilling a charisma which he believed he had been given but could not turn into reality because he had only two years of schooling. This disqualified him but the shortage of priests and the fact that he knew the New Testament and the liturgy inside out did finally make him eligible, to take a number of seminars and, after the briefest stint as a deacon, to become a priest. Knowing when to bend the rules is one of Orthodoxy’s greatest virtues. He was a charming and knowledgeable guide. Evrostina is 700 metres above sea level and used to be called the Switzerland of the Peloponnese until a devastating fire in 2000 destroyed its hinterland but not the spectacular mountains that surround it. The town was saved and is all the more attractive because its residents resist mass tourism. The view from the church’s spacious courtyard (once the cemetery of the older church) is awesome. (3) Church aside, it is a wonderful excursion, and an excursion that can include Panagia Ton Katafigion . (1) An open palm displayed facing someone is an insulting gesture in Greece, especially towards someone you have bested!